In a 6-2 vote yesterday, the U.S. Supreme Court ruled, or rather upheld an earlier ruling, that bars parents from suing drug makers over vaccine side effects. The ruling yesterday upholds immunity granted to drug companies via the National Childhood Vaccine Injury Act of 1986 (NCVIA). NCVIA grants immunity to vaccine makers against certain lawsuits related to vaccinations, for example, injury or death that may result from a vaccine. NCVIA also requires that people who want to claim vaccine-related injuries need to go through a special no-fault federal vaccine court; The National Vaccine Injury Compensation Program (“Vaccine Program”). The Vaccine Program is a no-fault compensation scheme. If a parent feels that the administration of a childhood vaccine harmed or killed their child, they cannot sue the vaccine maker, but they may still petition the federal government for monetary damages. Congress felt the Vaccine Program would be a faster, more flexible, less expensive and less adversarial option than a civil litigation. The Vaccine Program doesn’t always work, however. In yesterday’s case, Robalee and Russell Bruesewitz of Pittsburgh, filed their lawsuit after the Vaccine Program failed to compensate their claim. The Bruesewitz lawsuit noted that the couple’s daughter was a healthy baby up until she got a diphtheria, tetanus and pertussis vaccine, made by Wyeth, in 1992. After getting the vaccine, the baby, according to the parents, started to experience seizures and other problems. Now, according to the lawsuit, the girl will need care for the rest of her life. Wyeth, now Pfizer Inc., claims the Bruesewitz’s daughter’s injuries are not vaccine related. Pfizer also noted that if the Bruesewitz’s lawsuit won, a flood of vaccine lawsuits at the state level could threaten the supply of childhood vaccines. This new ruling means parents cannot take legal action beyond the Vaccine Program if they feel a vaccine has harmed their child. What do you think? Should parents be allowed to sue drug companies over lawsuits related to vaccine side effects? In a 6-2 vote yesterday, the U.S. Supreme Court ruled, or rather upheld an earlier ruling, that bars parents from suing drug makers over vaccine side effects. The ruling yesterday upholds immunity granted to drug companies via the National Childhood Vaccine Injury Act of 1986 (NCVIA). NCVIA grants immunity to vaccine makers against certain lawsuits related to vaccinations, for example, injury or death that may result from a vaccine. 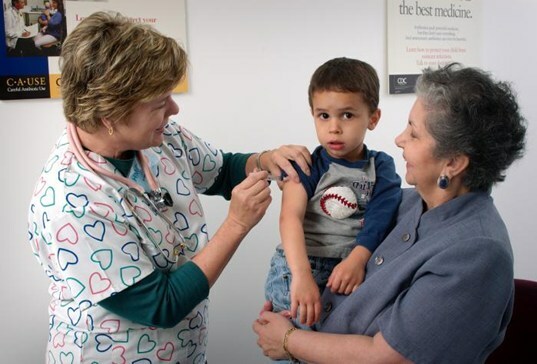 NCVIA also requires that people who want to claim vaccine-related injuries need to go through a special no-fault federal vaccine court; The National Vaccine Injury Compensation Program ("Vaccine Program").